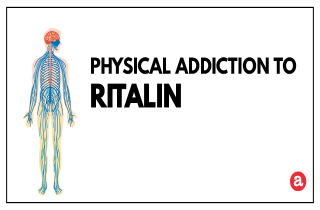 Recognize the signs and symptoms of physical addiction to Ritalin in yourself or in someone close to you. How can physical Ritalin addiction be treated? More, here. Ritalin (main ingredient methylphenidate) is a prescription medication intended for the treatment of ADHD – Attention-Deficit Hyperactivity Disorder – and narcolepsy. While effective when used therapeutically, Ritalin does have the potential to become habit forming. In fact, the DEA classifies Ritalin as a Schedule II drug in the Controlled Substances Act, which means that it has a high potential for abuse and dependency. So, are you facing problems with physical addiction to Ritalin? The good news is that help is available! We review the signs of Ritalin addiction and offer ways to get help in this article. Then, your questions are welcomed at the end of the page. Physical dependence is related to changes in the brain and body that occur as a result of regular use of Ritalin. The main signs of physical dependence are the development of both tolerance and withdrawal. When a person develops tolerance to Ritalin it means that the body gets used to this drug; the wanted effects are “dulled” from the given dose, so doses need to be increased. Withdrawal syptoms occur when the usual dose is significantly lowered or you discontinue Ritalin abruptly. While uncomfortable, withdrawal can be treated and medically supervised. So, what’s the main difference between drug dependence and addiction? Depdence is an expected process and outcome when you use this medication…addiction is NOT. Q: How is addiction different than physical dependence? Physical dependence = expected response to the medical use of Ritalin. Addiction = non-medical and/or uncontrollable use of Ritalin. Furthermore, Ritalin addicts usually seek the drug compulsively and feel unable to stop, despite countless efforts to quit. You may be addicted to Ritalin if you are using the substance for reasons other than the intended or if you crave Ritalin and feel a need to take it again and again. One of the more serious effects of Ritalin withdrawal include heart rate changes and complications. Ritalin abuse can increase heart rate and elevate blood pressure, which in some cases may lead to strokes and even a sudden death. Ritalin helps the user reach higher attention, wakefulness and focus. However, when Ritalin is stopped abruptly it can have the opposite effect. The consumption of Ritalin decreases your appetite, which may lead to malnutrition and a lack of nutrients in the body. With repetitive use or high doses and abrupt withdrawal, Ritalin can cause severe nutritional imbalances that might cause very serious and harmful complications. One of the main purposes of Ritalin is regulating sleep. This drug is even indicated for individuals who sleep excessively to control their sleep disturbance. After chronic use of Ritalin, users have a basic decrease in sleep. Going cold turkey off Ritalin can either worsen the decrease in sleep or increase it to abnormal levels. Lowering Ritalin tolerance – Your doctor can help you create a tapering plan based on your physical readiness, dose, and duration of Ritalin use. Tapering helps lower doses over time so that withdrawal is gradual instead of sudden. Detox from Ritalin – Treating the symptoms of Ritalin dependence starts with a process called detoxification. This is a procedure usually done under medical supervision and may include the prescription of antidepressants in some more extreme cases of dopamine or serotonin deficiency. Ritalin treatment program – If you suspect that your problems with Ritalin are mainly psychological, you might benefit from professional intervention. Treatment programs offer the needed psychological counseling, cognitive behavioral therapy, and other treatments to help avoid relapse and increase chances of successful recovery. A Ritalin dependent individual may choose to enroll in an inpatient or an outpatient rehabilitation program. a) During inpatient treatment, you will reside in the hospital or rehab center as you work on your recovery. Inpatient rehabs are recommended for heavy Ritalin users. b) An outpatient rehab clinic is an option fit for people who need to continue attending daily life obligations while participating in treatment. As a part of an outpatient program, you will be required to visit for treatment session on a regular basis, but you will continue to live at home. Do you have additional questions? Would you like to learn more about the identification and treatment of Ritalin addiction? We welcome your questions in the section below and we will try to provide a personal and prompt response. Hi Louis. I suggest that you speak with your doctor about your concerns.